The Match 5.0 Indoor Table Tennis Table from Kettler is a very popular choice. Comes complete with net, bats and balls. Throughout the world KETTLER is a leading brand in sports and fitness equipment. Since 1949, the company has grown from a small enterprise in Heinz Kettler´s home town in Germany into a world-wide manufacturing organisation, selling in 60 countries and employing 3000 people. Heinz Kettler has always remained true to the "made in Germany" quality principle and it is still the central pillar of the company´s management philosophy. Ask any German to name a well-known manufacturer of quality sports equipment and you will more than likely hear name Kettler. These tables will provide years of good service and for the level of quality represent extremely good value for money. 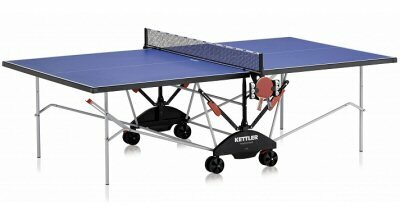 We are very pleased, therefore, to recommend the full Kettler range to anyone considering buying a table tennis table. EVERYTHING INCLUDED including FREE Bats & Balls! Easy to set up and fold away for storage with the net always in position. Special anti-dazzle playing surface. Non-tip transportation trolley with four guide rollers. Folding mechanism with double safety catch. Easy to assemble sturdy frame of oval tubing. Net permanently fixed. Solo training facility by folding down one side (see photograph below of the indoor Stockholm model). International tournament size: 274 x 152.5 x 76cm (when folded 55 x 183 x170cm). The indoor version has a 19mm special wood surface, while the outdoor version is corrosion resistant and has a 22mm weatherproof aluminium top that is lightweight and maintenance free. Accessories included. This table is delivered by courier service and we will contact you by telephone to agree the delivery day with you. Delivery of this product will usually be 3-5 days. Deliveries will take place usually between 9am and 5pm, Monday to Friday (excluding Public Holidays). If there is a significant delay to the delivery route then we will endeavor to contact you to let you know. Whether you are buying a table tennis table for family fun or for club use, KETTLER table tennis tables are a good choice. Available in both indoors and outdoors versions, they offer great value for money. Our outdoor models have the pioneering ALU-TEC technology for the optimum bounce and also have a 5 year table top warranty.